Vote for your FAVORITE Cloudentines and Valentine’s Day Themed Avatars! We had another great turnout for the Cloudroid Valentine’s Day Contest ! Now it’s time to vote for your FAVORITE Cloudentines and Valentine’s Day Avatar!! Voting ends 2/18/2012 and winners will be announced the same day at 8PM PST!!! Good luck Cloudentines!!!!! Cloudroid’s 2nd Annual Valentine’s Day Contest!!! It’s that time of year again! Yes…love is in the air and the Cloudmances are on! Let’s spread the love in the latest and greatest Cloudroid Competition, Cloudroid’s Valentine’s Day Contest! CLOUDROID COUPLES- Post a real (or photoshopped together) Valentine’s Day themed avatar of you and your Cloud Valentine! For those of you who haven’t caught “Cloud Feelings” yet, post a Valentine’s Day themed avatar! Remember–we must be able to recognize the user(s) in the avatar! ALL avatars MUST adhere to chat room avatar rules listed below. NO exceptions! Inappropriate avatars will be disqualified and you will not be exempt from flagging!! MAXIMUM of THREE rewards. One for your avatar on Cloud, and for an extra reward, email your photos to JennyonCloud@Gmail.com so we can post your avatar on our Facebook! For another extra BONUS 1000 Pop Points post the picture on your own Facebook and “tag” Cloudroid! ALL participants will receive 500 Pop points and 500 coins. Gomoku is an abstract strategy board game. Also called Gobang or Five in a Row, it is traditionally played with Go pieces (black and white stones) on a go board (19×19 intersections); however, because once placed, pieces are not moved or removed from the board, Gomoku may also be played as a paper and pencil game. This game is known in several countries under different names. Since Black plays first, Black has advantages over White, especially in top-class games. 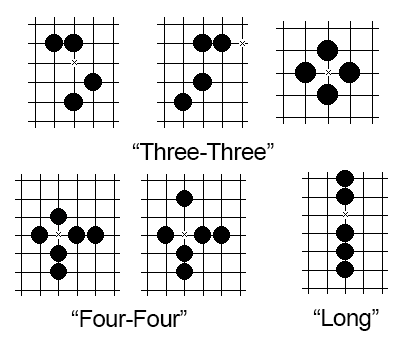 To restrict Black and provide a fair game, Gobang with Forbidden Hand rules disallow Black from making moves that form two of “Three”, “Four”, “Long” moves at one move, or their mixtures, as shown below. If Black places move at X position in following cases, Black will lose the game. Words Online is a word searching/erasing puzzle game that combines Scrabble, Jewels and Boggle. In the game, players connect conjunctive bubbles to form valid words, and gain scores, bonuses and power-ups that can be used against the opponent. There are 8 directions for movement, and 4 power-ups to be used: self score boost, opponent score contract, opponent game board frozen and self game shuffle. You also get a chance to gain score multiplier during game, either x2 or x3. The first player who gains the required score wins the game. The game is also known as Words, Word Search, Word Drop, Scramble, Scrabble. The game is played by touching and connecting letter bubbles to form valid English words (or other languages in the future). When the touch is released from the screen, the game judges the correctness of the word and assigns points, bonuses and power-ups to the player. In a real-time online game, 2 players compete against each other and whoever gets to 300 points wins the game. There are 6×6 letter bubbles in the game board to be used. Once a word is connected, it is removed from the board and new letters are refilled. 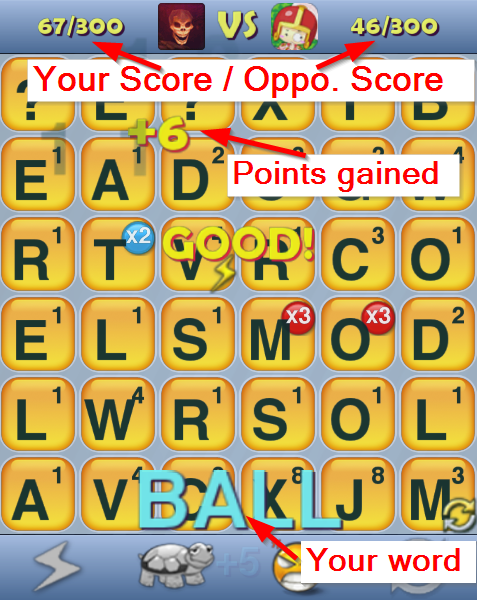 Each letter has certain points assigned, and are gained by the player when it is removed from board. There is a special letter ? that can be used as a wildcard to help player form words. For example: Touch and move from B -> ? 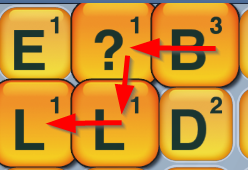 -> L -> L, as shown in below, will form a word B?LL in next image. Your game score is calculated by 3 elements: Basic points, Multiplier and Bonus. Basic Points: On the top right corner of each letter is the basic points. When you remove a letter, you gain the basic points. Multiplier: Some letters are assigned a multiplier randomly in game, which when removed will grant multipliers to basic points for double or triple. Bonus: When you make a word, the length decides bonus. 4-letter word gets 5 bonus points, 5-letter word gets 10, 6-letter word gets 20, 7 and up-letter word gets 40. When you connect G(5) O(6) O(x2) D(x3), your basic points are 5+6=11, your multiplier is (x2x3=x6) and bonus is 5. So you get points 11*6+5=71. Another example, when you connect I(x2) S(x3), your basic point will be 1 (default point when no basic points available), your multiplier is x6 and bonus is 0. So you get points 1*6+0=6. As you can see, to gain a good score in short time, you need to use multiplier and bonus cleverly. Moreover, you can use power-ups. Block your opponent’s screen, show him/her a big face on the screen that he/she has to keep tapping/swiping to remove it. Clear out your current game board and refill with random letters. Useful when you get stuck finding words. When you remove a letter with a power-up on it, you get that power-up. When you make a 6-letter word, you are assigned a random power-up. When you make a 7 and up-letter word, you are assigned 2 random power-ups. Note that game assigns power-up regardless of your current power-ups. For example, if you already have a +20 score power-up, and the game gives you another, you will still have one of this power-up (the new one overrides the old one). Power-ups do not stack. Simply tap the power-up on the bottom bar. How does game generate power-ups? When you make a 5-letter word, a letter in the word will be put on a random power-up. When you make a 6 and up-letter word, 2 letters in the word will be put on random power-ups. Whenever you remove a correct word, you have a small chance that the game will generate a power-up and put it on a letter. Put your thinking caps on Cloudies, we’re having a Contest Contest! Lack of holidays unfortunately means lack of holiday avatar contests…but shouldn’t mean lack of contests! We will be having a series of contests made by YOU the Cloud users. Submit an ORIGINAL (non-holiday avatar/avatar contest we have already had will not be accepted) idea for a contest on Cloudroid to enter! We will have a normal poll for Cloudroid users to vote on for the best ideas. If your Contest Idea is chosen (Via polls OR Officers) you will win a fabulous POP Prize…we will name the Contest after you, and of course you will be a judge in your own contest! -Original Ideas will be on a first come, first served basis. If someone else already had your idea before you submitted it, you will still be rewarded, however it will not be entered as your idea on the polls. For an EXTRA Reward, “Like” Cloudroid on Facebook and reply with a comment on the Contest Post! GOOD LUCK CLOUDIES! And as always Happy Clouding!!! St. Patrick’s Day is coming up…..! So what would you find at the end of a Cloudroid Rainbow?? A pot of Gold Coins and POP Points of course!! Celebrate St. Patrick’s Day on Cloudroid on March 17th by posting up an avatar of yourself wearing GREEN! You may get lucky and find yourself 100 Pop Points and 500 gold coins richer!!! May your day be filled with some Irish Luck….Have a fun and safe St. Patrick’s Day Cloudies!!! Thanks to all you Cloudentines for participating in Cloudroid’s First Annual Valentine’s Day Contest! The First Place Winners of Best Valentine’s Day Avatar and Best Cloudroid Couples were also award FREE VIP on ANY account! Congratulations again Cloud Love Birds! Stay tuned for the next contest!! Happy Clouding!